I have been listening to this album non-stop for two days, and almost feel bad talking about it now because it's not due out until 7th June on BBE. I came across Richy Pitch through my friend M3nsa who is a very talented rapper from Ghana based in London, and we've been cool ever since - he's such a lovely guy I was actually scared to listen to his music because I would have felt awful if I didn't like it! Luckily I truly love this album - it flits between Afrobeat, hiplife, highlife, hip hop, electro, and ragga with a proficiency that's truly outstanding for a guy from England who went out to Ghana to visit a couple of years ago. 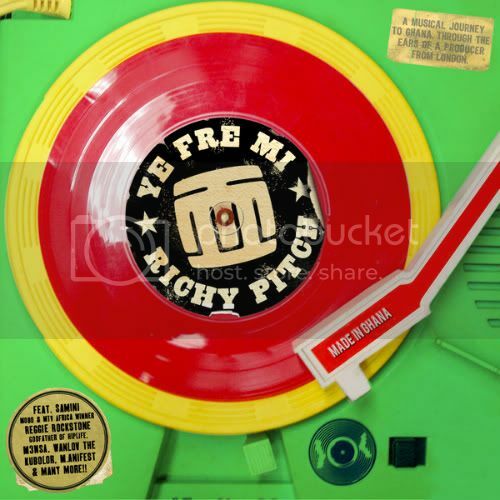 Perhaps it's a testament to his production skills, or perhaps to Richy's openness towards the culture of Ghana - the title means "they call me Richy Pitch" in Twi, because he refused to be known as "Obroni" (white man), and the album is littered with the kind of soundbites anyone with African connections will smile at.